Two of our authors have recently bought beautiful Japanese combs. 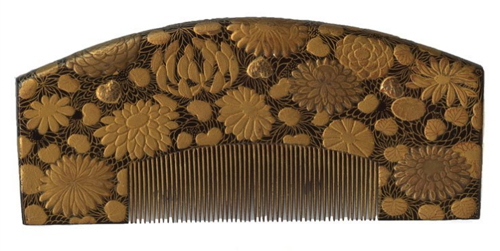 Miriam Slater bought this late Edo lacquer comb with a geometric petal-like background underneath painted chrysanthemums, dahlias, peonies, and hearts, all done in gold maki-e. 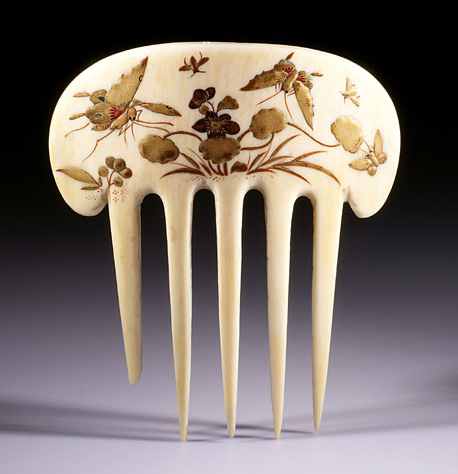 The Creative Museum added this ivory Taisho piece to their collection. It was made c. 1920, has a French shape for the European market, but is decorated with a classic Japanese theme: insects feeding from flowers. The gold maki-e paint has tinctures of red pigment.